Got Water Of Life? Give Water Of Life. This is the second Sunday of a Spiritual Growth Campaign called, “What Would Love Do?” We are looking at both our own spiritual development and at the question of how can we be of service to others? 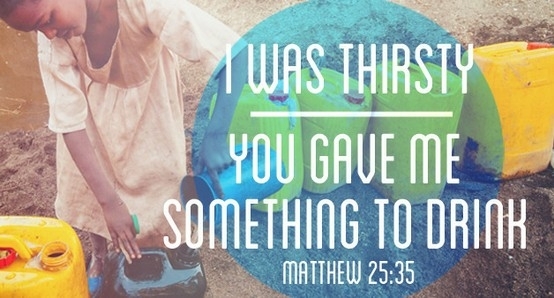 In Matthew 25 there is a parable that addresses these two things. How about for you? Are you thirsty for understanding? Do you want answers that can heal your mind and life? Come and drink freely from the water of life that the Lord offers in His Word. You may be surprised at how much sense the Word can make when seen in its deeper meaning. Practical help for your daily and eternal life. 2 Responses to Got Water Of Life? Give Water Of Life. My family has moved to colorado due to our daughter’s medical problem.We’ve studied the spiritual sense of the word for more than a decade now.My father is a true follower and he has taught this teaching to us almost half of my life.We moved from South Carolina where our beliefs are not accepted.It’s truly a blessing to know you all share the same beliefs as us.It’s rare to find a swedenborgian congregation, Lord’s willing my family and I will join you all in service soon.My wife name is Tabitha, we’ve been married 13 glorious years.We have 3 children. Jenasis our oldest daughter is 4, Gabriel our second eldest is 3, and Cainaan our youngest son is 2. Thank you for writing Gabriel! I am glad you have found us and hope to meet you all soon. I very much look forward to it.